The failsafe choice for a drink when a Londoner is marooned at Clapham Junction, but none the worse for that. The bar that snakes around this pub is, according to the Guinness Book of Records, the longest in the UK, and on a Friday night I’ve certainly made my own world record attempt at being the man waiting longest to be served. 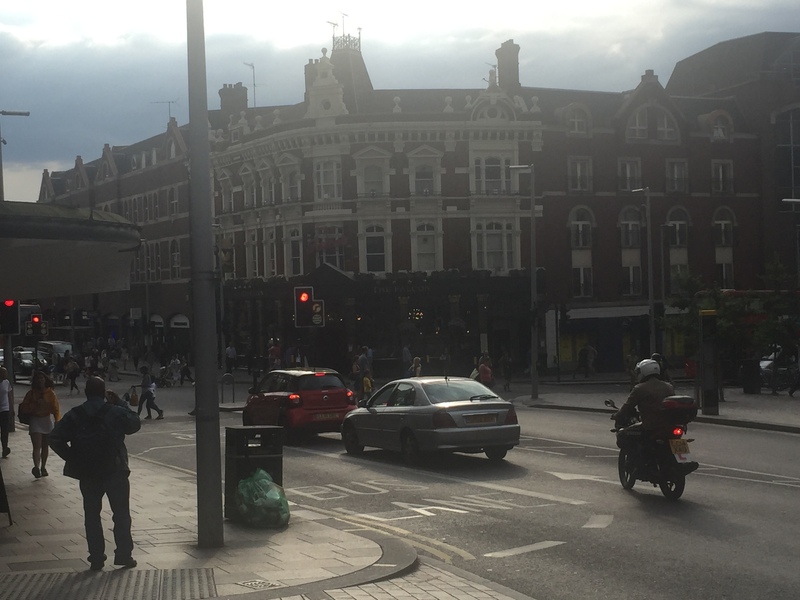 The Slug and Lettuce is nearer to the station exit on St John’s Hill, but don’t fall for it. An inscription on the Falcon’s wall claims the bar was designed by Dutch optical artist Escher, but I’ve always assumed this was a joke because the bar is long and convoluted and you can’t work out where it begins or where it ends. The cask ale is ever-changing, but at the time of writing there were £3 pints of Bombardier and Jennings Cocker Hoop, and – at more familiar wallet-hitting prices – of Mosaic IPA, Portobello VPA, Cattle Shed pale ale, Monty Python’s Holy Grail from Black Sheep, Wainwright, Marston’s Pedigree, Exmoor Gold, Red Squirrel’s Hopfest pale ale, The Reverend James and Tribute, as well as the usual Carling, Meantime, etc. 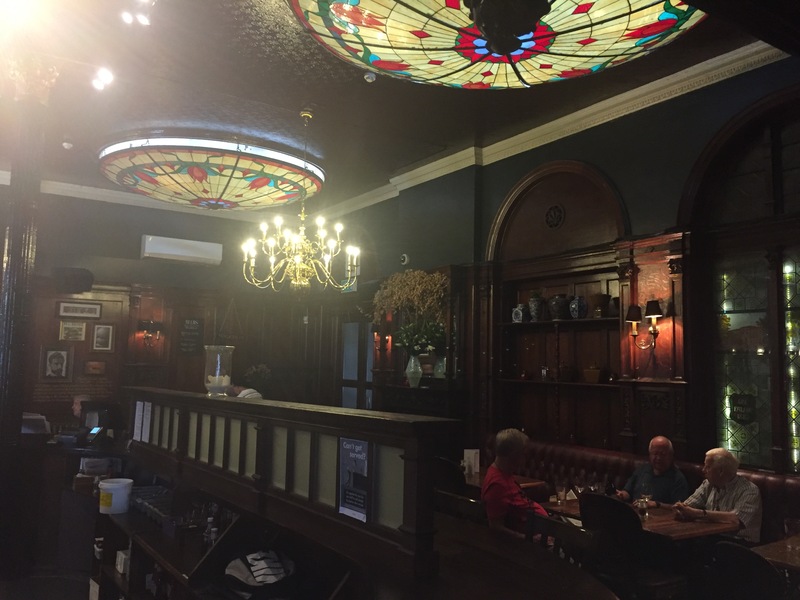 The pub had also converted itself into a gin palace for July and August, with premium gins such as Little Bird, Tarquin’s and The Botanist on display, to be paired with Fever Tree tonic of course. Wood-panelled, with chandeliers, black and gold Greek columns propping up a high ceiling, cut glass partitions and stained glass windows, this is a handsome corner pub with dramatic light – a cathedral dedicated to booze. But I think the seats to bag are the always popular padded armchairs in the cloisters – the dim, book-lined snug. Partitioned off behind cut glass, you can almost fancy yourself ensconced in a gentleman’s club. 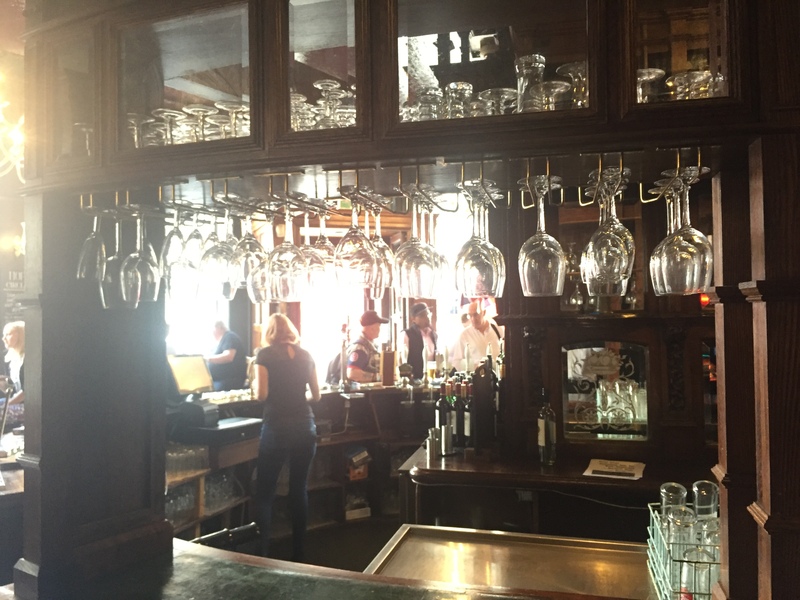 There’s a dining room to the rear, and a few seats around the windows, but it’s often standing room only at the bar for drinkers at busy times. Clapham commuters should feel at home. With a handy cab rank outside, this Taylor-Walker chimneyed mock-Tudor pile hung with flowers boasts a welcome beer garden for summery days. The mock continues inside with ‘book-lined’ wallpaper, the chairs and tables all seem the wrong height and the layout all wrong – but the beer is good enough. I like the Pilsener Urquell, served in a jug, although it’s pricey at £5 a pint. 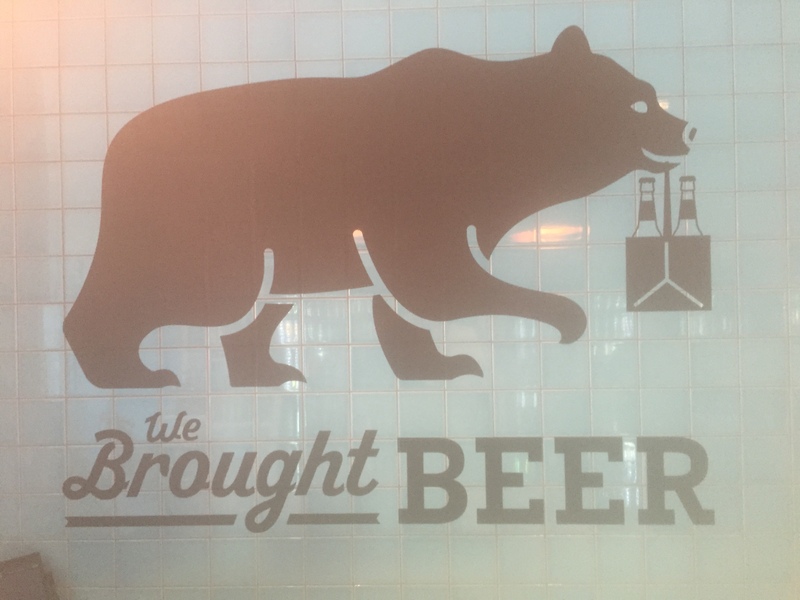 A coeliac friend makes this a regular stop as it serves gluten-free 1730 ale in bottles. This is a drinkers’ pub, with crowds of locals and workmen swilling down lager and the odd pint of Truman’s and local brewery Sambrook’s. But it’s in the beer garden – or yard – that this place comes into its own. An attempt at posh dining practices outside is half-hearted – I’ve never seen anyone eat here anyway. Teapots on tables are filled with withered flowers, their leaves sprayed with ash. You can often be disturbed by the bins being collected from numbered garages to one side of the concrete yard, cars and cabs buzz by the other side of the iron gate to the other, and there’s always the chance of being spotted by your boss from the Clapham Junction footbridge above. 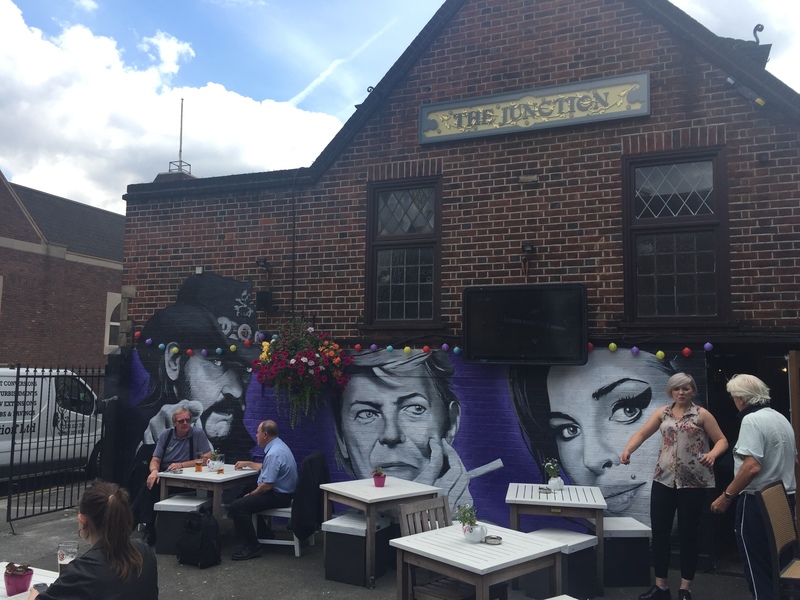 But I like these dusty, grey London beer gardens, especially as they’ve jazzed it up with a big mural of London legends Amy Winehouse, Bowie and, er, Lemmy and with an outside TV that always seems to have the sun shining directly on to it. 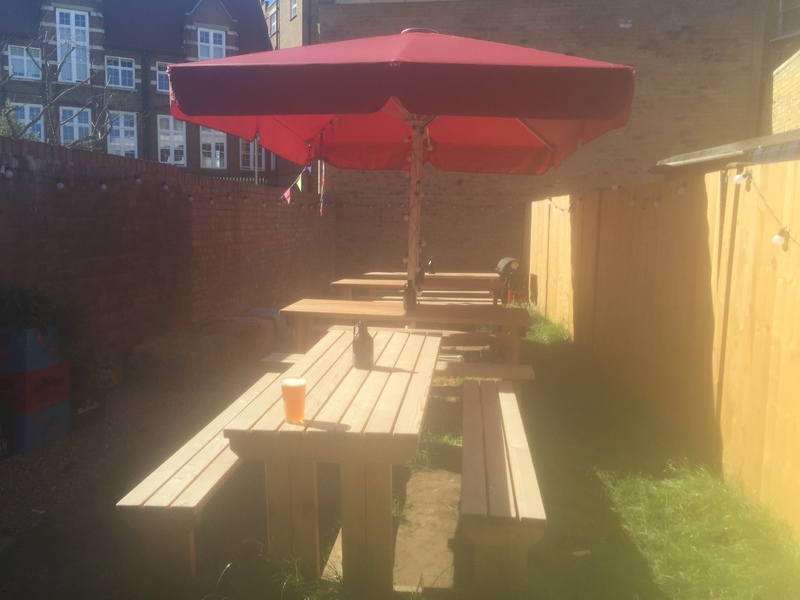 There’s a central pod of tables with a big parasol and a heater, and it’s a lively, friendly, rowdy beer garden on a Friday night. 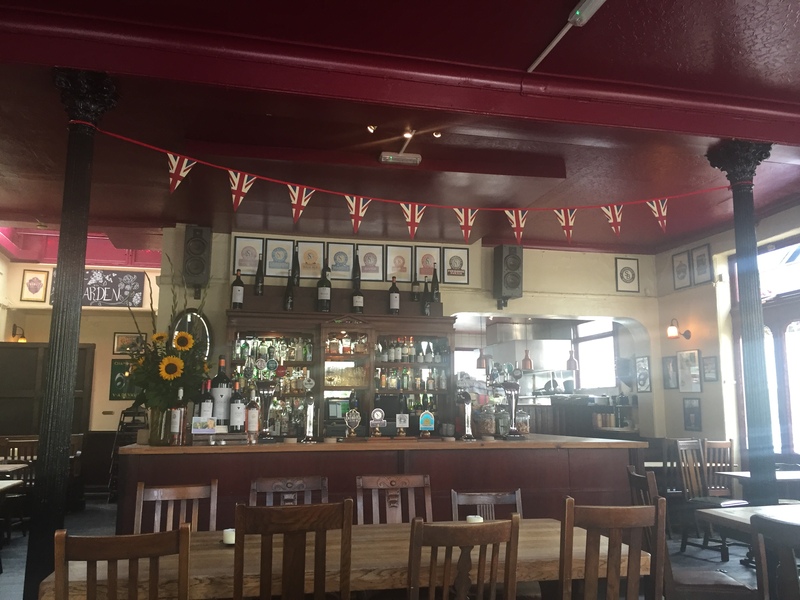 With its bright canary exterior, its loud, friendly, lager-drinking locals sunning themselves on the pavement and its British bulldog name, you’d be surprised to detect an Eastern feel in this pub. Yes, there are old fruit machines, jellybean dispensers, horse racing ads and an old seventies stripey purple carpet. There’s a stag’s head on the wall, a giant Guinness branded jenga set, a kid’s scooter and a perfectly still, silent dog that you might think is stuffed in the footwell of a fruit machine. But look closely and there are Eastern elephant tapestries and Buddha masks on the walls. Through the narrow, lamplit interior, past the crowded bar crammed with locals trying to work out how to fix the broken ceiling fan, there’s a pretty beer garden, with vines over the entrance, a gurgling fountain and a Buddha statue. Very Zen. And at £2.60 for a house double and under £4 a pint, the prices are enough to make you go ‘Ommmm’ too. They also serve Thai food. You can see the Fox and Hounds from the train as you clatter into Clapham Junction from Victoria. Then it tantalisingly slips away. Happily, it’s a short walk to refind this pub with its split-level bar room and airy summery feel. Sunflowers at the bar, Union Jack bunting and light pouring through the windows give this place and airy, summery festive feel. 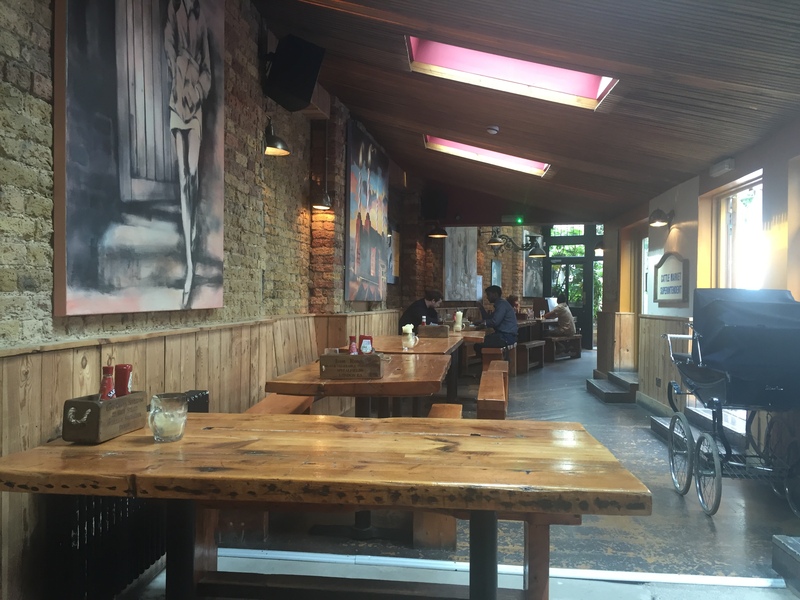 It’s filled with simple wooden tables on bare boards, and every spare inch of the walls is covered with framed booze-related paraphernalia. An open kitchen pours out bright, vibrant Mediterranean food (tuna nicoise, prawn linguine, lamb with caponata) and has a 40-plus long list of wine to be paired with it. But this isn’t just a gastropub for the well-heeled. The four pumps promised Tribute, Sambrook’s Lavender Hill, My Generation and Twickenham Summer Sun. Also on the quaff list was Korev Cornish lager, Fox pilsner, Pilsner Urquell, Estrella Damm and Peroni. 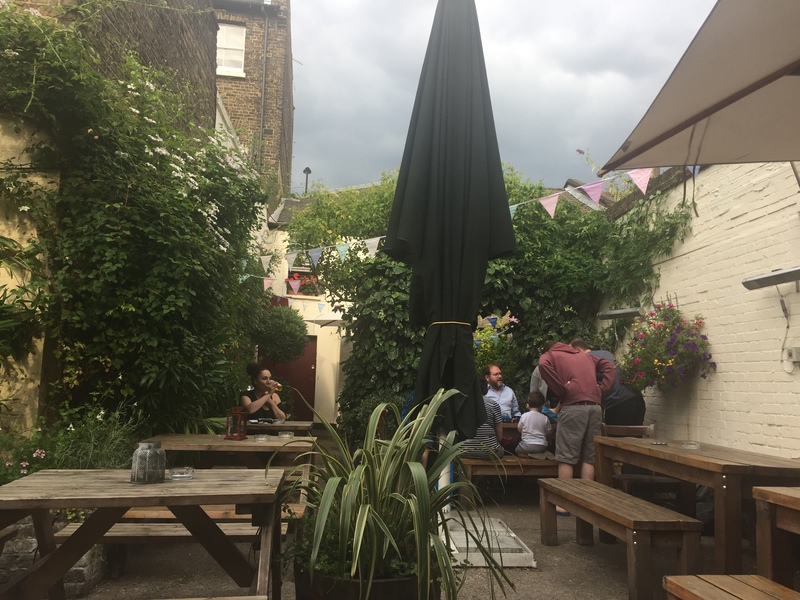 The long lager list made sense when I headed for the back garden, an L-shaped secluded oasis of picnic sets where a roaring trade in solitary drinkers, children and dogs was being done. 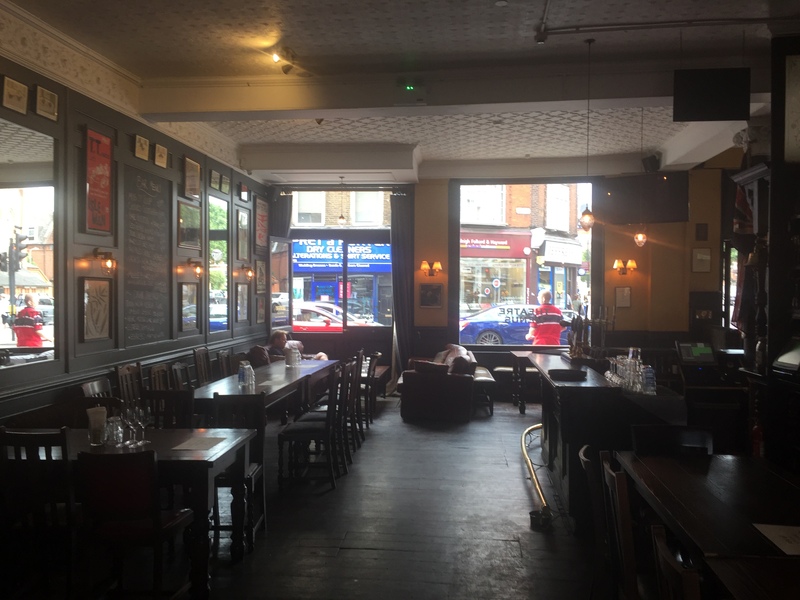 This beautiful, imposing Italianate corner pub with a theatre on the first floor has been recently refurbished and its facelift has happily left it looking more Scarlett Johnansson than Donatella Versace. 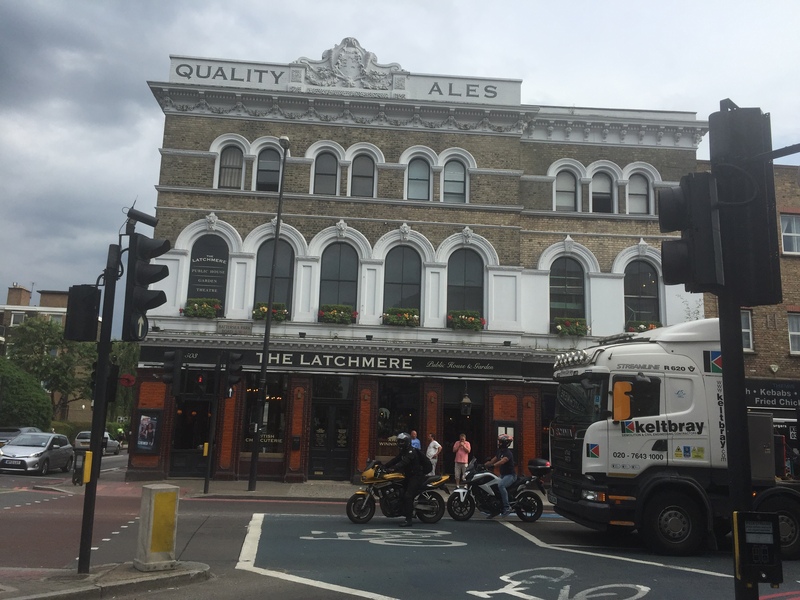 It’s a beast of a pub, with its ‘Quality Ales’ lettering on its roof a beacon for all thirsty Battersea residents, and those prepared to take a slightly longer 10-minute (0.7 mile) walk from the station. The roomy front bar and pavement looking onto a busy crossroads is full of Lacoste-shirted locals. In the back, two beer gardens adjoin each other, one for kids with no smoking allowed, the other a courtyard with a small bar with Kozel (£4.50) and Peroni on tap with sheltered benching around the edges and terraced housing beyond. There’s a brick snug and, at a large communal central table, Phoebe and her friends are actually playing the board games that are inexplicably put in pubs these days. They really know how to do beer gardens in this part of town. They’re kid and dog-friendly and serve tempting stomach-lining bar snacks such as chorizo Scotch eggs, jerk chicken wings and hake goujons. There’s also modern British pub food to be had at mealtimes. On draught is Timothy Taylor Landlord, Harveys, Leffe, Kronenbourg, Peroni and Kozel. The first floor houses the Olivier award-winning Theatre 503, which specialises in new writing. Where better to enjoy the interval – and if your bum is aching, maybe the second half as well? 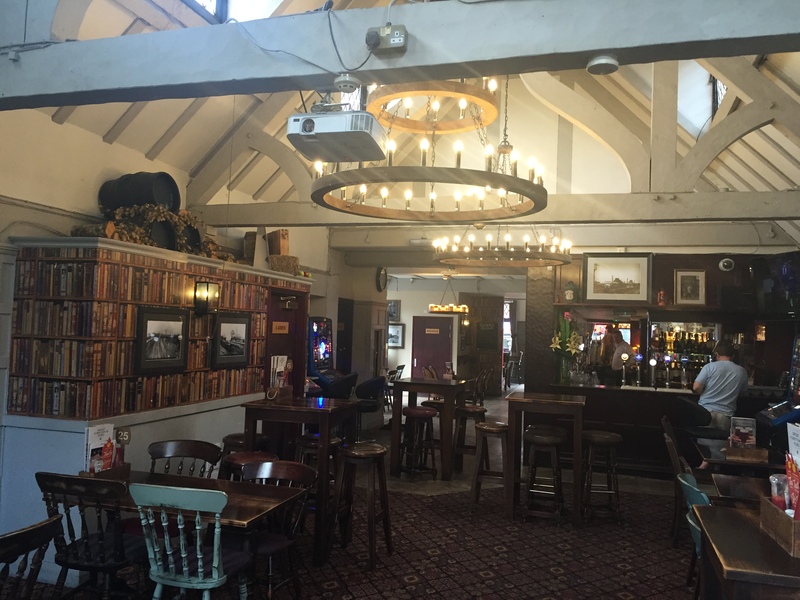 In honour of the Price’s candle factory that once stood on nearby York Road – and at the turn of the twentieth century was the largest candle maker in the world – the Candlemaker pub is full of blackened pint jugs with candles in. In the window, gin bottles stream with molten wax. But in most other ways, this is a very modern pub with its insistence on creating different areas for different crowds. 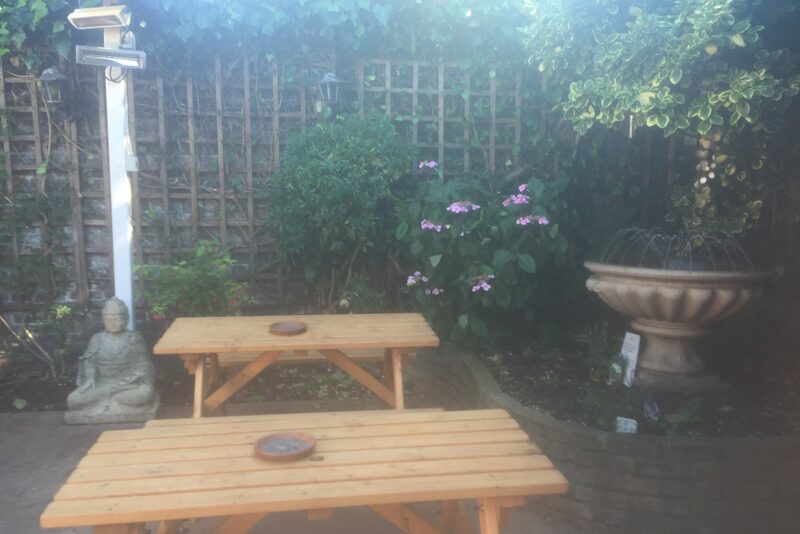 So there are two very different gardens, different styles of seating, of lighting, of décor, for different styles of eating, drinking and conversation. Like many pubs in this area, its outdoor spaces are exemplary. 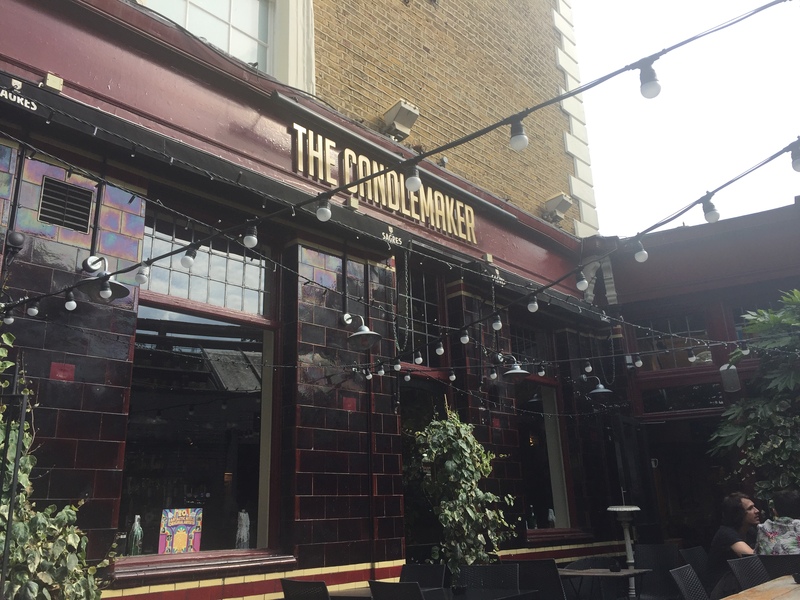 The Candlemaker’s front garden, curling around the handsome exterior’s black and maroon tiling, is hung with bulbs and pot plants. Young professionals loll and smoke at big wooden tables. At the back, there’s another outdoor space with leather sofas and cosy pods. There’s a wood burner at the back of the long, wooden-slatted interior hung with pop art for when the weather is less mild. 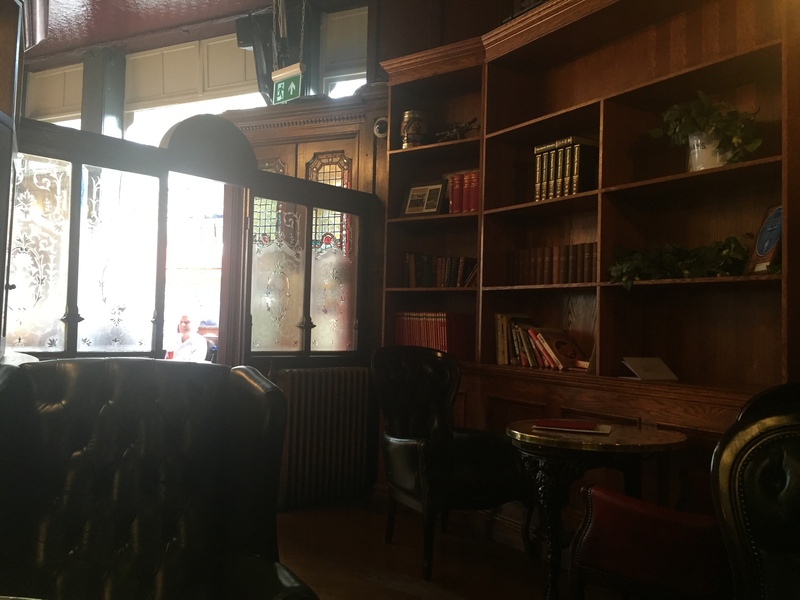 The front bar is lighter, brighter and convivial, with bench seating, a big Chesterfield and bigger windows. A thoroughly sun-dappled place to enjoy a pint of their Laine’s Brighton Pale Ale – if not the five pound plus price. Not a pub, and our seventh entry, so strictly speaking I’m cheating, but this is a bottle shop that sells beer on tap with a suntrap back garden decked with hay bales and picnic tables to drink it in. 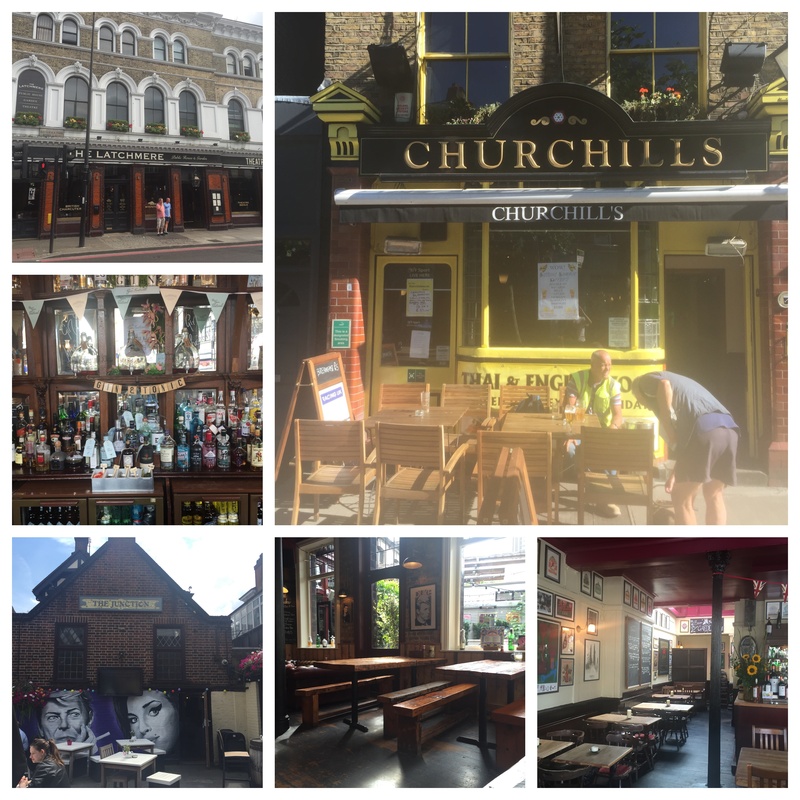 It’s the only beer garden, the server tells me, apart from Churchill’s, on St John’s Hill. And no pub can hope to compete with over 400 beers to choose from. From the four ever-rotating taps, London Beer Factory’s Paxton IPA isn’t cheap (£5.30), but there’s every craft beer you can think of stacked up in the fridges full of cans and bottles. There’s a 20 per cent discount on buying full cases as well, although you might struggle getting those on the train. But a half-gallon growler might be just the ticket for the journey home. Or you can load up on home-brew equipment. 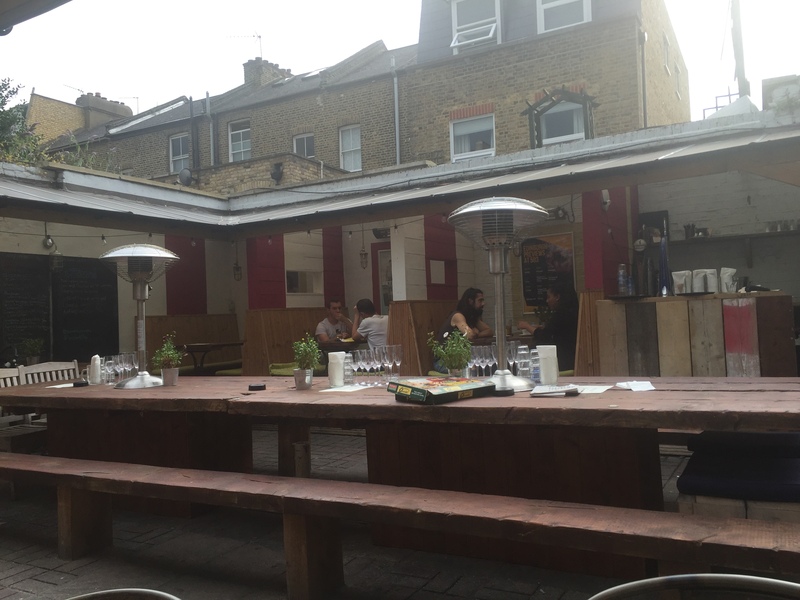 The beer garden is kid and dog-friendly and it’s well worth a quick stop. 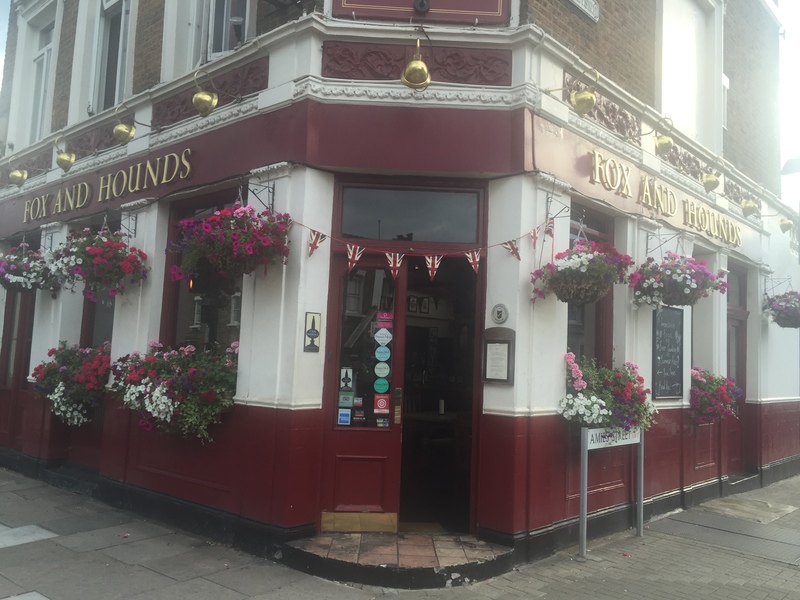 This entry was posted in Battersea, Drinking and tagged in churchill's, clapham junction, clapham junction pubs, falcon sw11, fox and hounds, fox and hounds sw11, latchmere, london pubs, pubs sw11, south london pubs.